Wife Of Cameroonian Soldier Killed In Mamfe. Elements of the Cameroon military have been accused of Genocide in the two English-speaking Regions of Cameroon. 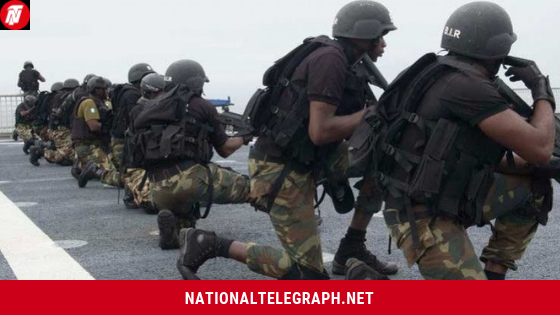 The wife of an element of the Cameroonian military has been killed in Mamfe, a restive town in South West Cameroon, locals have told National Telegraph. According to reports, she was killed early Sunday April 7, 2019 at Laterite Pit, a small neighbourhood in the interior of the town, added a source in the locality. The killers are unknown and no one has claimed responsibility of the act neither have authorities been able to provide any clear information on the matter. It is however suspected that the lady must have paid dearly for her husband’s participation in what many now call Genocide in the two English-speaking Regions of Cameroon. The military has been accused of targeting the unarmed population, killing women, children, burning some alive in their houses. Hundreds of villages have been burnt down in actions that have been seen more in the light of a modern-day Genocide. It is possible that Ambazonian fighters in that area must have targeted the wife of the said soldier who like his colleagues has been accused by the population of committing heinous crimes against an unarmed population, said a source, adding that there’s however no direct evidence any armed group carried out the act. Next Cameroon: Uproar In Kondengui As Penn Terence Receives Serious Beatings! Relatives of those who kill and burn villages and those of traitors are all fair game. Cut them like swines.